This is chart designed to apply one of John Hattie's High Impact Strategies (HIS), providing students with what success in the learning target looks like, to comprehensible input based world language classrooms. It is based on Bryce Hedstrom's application of Bloom's Taxonomy to a CI classroom. CI classrooms are focused on interpretive communication (input), more so than presentational (output) and interpersonal (input/output) comminications, and thus focued on comprehension of the target langauge. This can make defininng what success looks like difficult and traditional markers a geared more towrds out driven tasks. 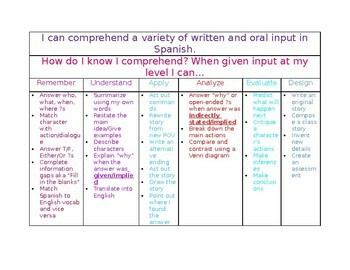 This chart will help answer the question what does successful comprehension look like. Please keep in mind that this chart is more like a guideline. While novice learners may not have the language skills to be able to do higher order tasks in the target language, they can certainly do these tasks in the L1 about input they received in the L2. 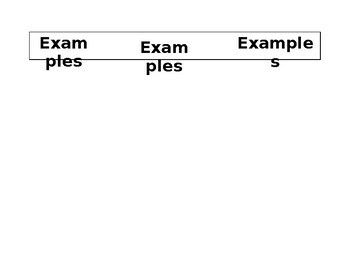 As students acquire more language they will be able to do more of the higher order tasks in the L2. This is editable so you can change to your TL, add any additonal examples, or change the colors. The document is 2 pages, but everything should fit on one page despite the thumbnails showing content on both pages. Please contact me if you are having trouble with the file.